This post will focus on how to visit the Roman Pantheon and take a tour of the historic site. In addition to helping you plan your trip, we will also give you an idea of what to expect and provide ticket information. NOTE: There are plans in place to start charging tourists €2 to enter the Pantheon. Those coming for worship are still welcome to see the historic site for free. All funds will go toward upkeep and repair costs. The following section will help you plan your outing to the Roman Pantheon. We’ll discuss the best times to visit, hours of operation, what to expect, nearby attractions and other important details you may want to know before visiting this landmark. 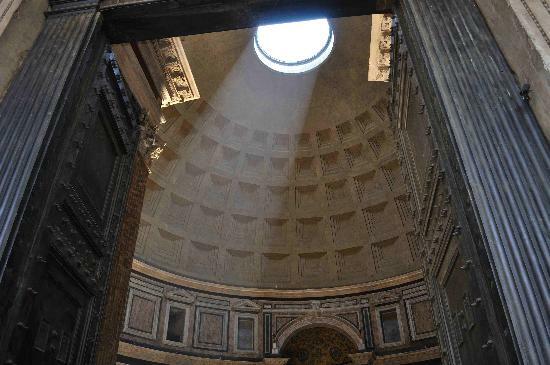 This photo of Pantheon is courtesy of TripAdvisor. As with most historic landmarks, the Pantheon can get pretty busy during certain times of the day/week. With that in mind, visitors who want to avoid the crowds will need to consider making their trip during the quieter hours. Although these are reasonable hours, there are very few time periods when the Pantheon is not popular. You can expect the largest crowds from the hours of 11 am – 6 pm. We recommend making your trip early in the morning between the hours of 9 am – 11 am for the best results. Additionally, it is important to note that the Roman Pantheon is much busier on weekends than it is during the week. You are more likely to avoid the larger crowds if you plan to go on either a Tuesday or Wednesday. Even though it can be busy during mid-day, several travelers recommend going between 11 am – 1 pm in order to catch the sun as it streams in through the oculus. Many visitors indicate the crowds are usually manageable even when there are a lot of people in the building. If you don’t mind being around people, you might want to come at a time when the Pantheon is looking its best. Another popular time to consider is during Mass. This is still a functional church and they hold services every Sunday at 10:30 am and Saturday at 5 pm. Although some visitors may want to avoid the crowds coming for these events, others should consider taking part in the Mass. For more details, check out our section on attending Mass. TIP: You may even consider visiting the Pantheon when it is raining or even snowing. Since the building has an open dome, the effect created by this precipitation is often times beautiful and unexpected. Many people actually recommend heading to this landmark when the weather is poor. The next important detail to keep in mind is that there are no tickets to enter the Pantheon. This is a free public site that anyone can visit without admission. 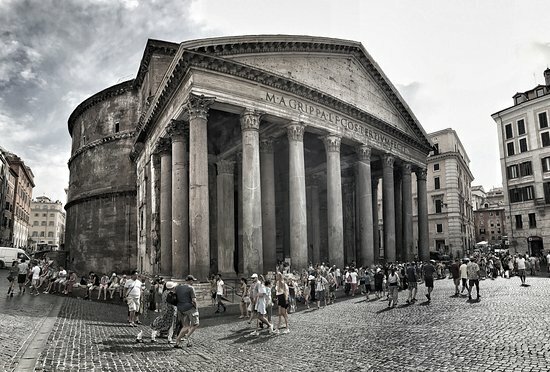 If someone attempts to sell you tickets to the Pantheon, just walk away. Alternatively, you can attempt to find a policeman or a security guard who can help. NOTE: The Italian Culture Minister has announced a €2/person fee for entry that was planned to go into effect in May 2018, but as of May, this fee is still not being charged. One of the first things you will notice about the Pantheon is that there isn’t a long list of prohibited items. Although you might not be able to bring large bags or professional cameras to other historic sites in Rome, you are free to use them here. There may be security guards keeping the peace, but you won’t be stopped for carrying a backpack or taking flash photography. With that said, there is a lot to see here and you may want to consider going on a tour. These services are not free, but you can purchase them ahead of time. For more information, check our Pantheon Tours section. If you plan on going alone, you should prepare to spend at least 30-60 minutes at the Pantheon. However, if you are going with a tour group, you can expect the trip to take anywhere from 1 ½ – 3 hours. There are several notable attractions within a 5-10 minute walk of the Pantheon. If you want to see more than just the immediate area, consider visiting locations like Trevi Fountain, the largest baroque fountain in all of Rome. Fontana del Moro is even closer, and it can be found in Piazza Navona. The Mausoleum of Augustus is about ten minutes north from here, but it is definitely worth a trip. Finally, we recommend heading about 15 minutes northeast to the Spanish Steps. For more details on this and many other historic sites close to the Pantheon, read our Guide to the Spanish Steps in Rome. There are several ways to reach this historic site, but the most popular method is simply to walk. Most people in Rome walk from one destination to the next, but there is also a metro system that you can use. For specific directions from your point of departure to the Pantheon, use this helpful Google Directions link and map. There are two bus stops near Piazza Navona, a location that is only about 5 minutes from the Pantheon. Alternatively, you can also use a hop-on, hop-off bus tour to get within walking distance. No matter which option you choose, you should prepare for at least a 5-minute walk to the landmark. There is so much to experience at the Pantheon that you might miss a few important details if you don’t keep an eye out for them. With that in mind, this section will provide information about the more notable things to see and do while at this historic site. This is the piazza right outside the Pantheon and there are a few things to see while you’re here. The first noteworthy attraction is the Fontana del Pantheon, a beautiful fountain found in the center of the piazza. You will also find an obelisk named Obelisco Macutèo which was originally from the Temple of Ra in Heliopolis. While you’re at this landmark, you may want to get a good look at it from the outside. The dome is definitely a sight to behold from the inside, but don’t forget to see its exterior as well. The portico, with its beautiful columns, is an excellent example of classic Roman architecture. Finally, the large bronze doors to the cella (inner chamber) are noteworthy because they are a bit too small for the frame. These are not the original doors, but they have been in place since the 15th century. Once you enter the Pantheon, you will see the Rotunda. This area was so perfectly designed that you could fit a 43.3 m diameter sphere in the center. This structure still holds the record for world’s largest unreinforced concrete dome. No matter where you look, you are likely to see a variety of different architectural features and religious symbols. The dome of the Pantheon is quite special because it has an oculus at the top which is open to the elements. This means that when it starts to rain, you will see the water falling down into the building. There is an area beneath the Oculus which was specifically created for runoff from rainwater. If you come during the day, you may have the opportunity to see the sun shining through as it passes overhead. Located inside the Pantheon, you will find the burial site of Raphael. This famous artist has been given a very special place of honor, with a sculpture of the Madonna del Sasso located above it. This statue was created by Raphael’s student Lorenzetto. If you’re interested in learning more about Raphael and his students, make sure to visit the Vatican Museums as well. Another notable memorial in this building is the tomb of King Umberto I. He was the son of Victor Emmanuel II and as a result, he was buried right next to his father in the Pantheon. He was married to Margherita of Savoy, for whom the Margherita Pizza was originally named. On the top of this monument is a stone pillow with a replica of the Iron Crown of Lombardy, signifying his contribution as a leader of Italy. There are several chapels located in the Pantheon with notable artwork adorning the altars. The Chapel of the Madonna of Mercy features a 15th-century painting entitled The Madonna of Mercy between St. Francis and St. John the Baptist. Other chapels include historic creations such as the sculpture of St. Joseph and the Holy Child by Vincenzo de Rossi. You can actually attend Mass at the Pantheon. This is still a functional church which provides services for the community. You can attend every Sunday at 10:30 am and Saturday at 5 pm. These time periods may be particularly busy, so if you aren’t interested in Mass, you may want to avoid coming during the event. There are a lot of tour services in Rome that offer a guided trip through the Pantheon. This section will provide all the information you need to choose the right tour for your needs. We will also talk about the audio guides you can use to take a self-guided tour of the landmark. For more tours that cover this historic site, check our post about City Centre Tours. Visitors who would rather avoid large crowds and just take a self-guided tour of this site may want to consider the official audio tour. This option is provided for a small fee at service desk inside the Pantheon. Although it is short, you will learn a lot about the building and its history while walking around and listening to the tour. This is also one of the most affordable options on our list. If you’re looking to save some money, you can always take Rick Steves’ audio tour for free! All you have to do is download the audio onto your smartphone and listen to it with a pair of earbuds or headphones. Although this option is a bit shorter than the official audio tour, you won’t have to pay anything to hear it. Click here to download Rick Steves’ Pantheon audio tour. If you’re looking for a short guided tour of the Pantheon, this is an excellent option. Over the course of an hour, you’ll learn about the structure and its historical significance. Your guide will provide specific details about the tombs, chapels, and altars located inside. Each booking includes a donation to the Pantheon so that they can continue to provide services. You can use either a mobile or printed voucher. This is an excellent option if you want to see more than just one historic site. In addition to the Roman Pantheon, your tour guide will also take you to the Trevi Fountain, the Spanish Steps, Piazza Navona and other landmarks. The entire trip will take about two hours to complete, which means you may not have as much time to explore the Pantheon. This three-hour tour will reveal everything you need to know about the Roman Pantheon and continue on to some of the more notable nearby sites. In addition to the main attraction, a tour guide will also take you to Piazza Montecitorio and the Mausoleum of Augustus. To finish things off, your tour group will head to the Ara Pacis. Headsets will be included for large groups to ensure that you can hear your tour guide. Both printed and mobile vouchers are accepted. NOTE: This tour requires a lot of walking, so it will be important to wear comfortable shoes. If you’re looking for a more family-friendly trip to all of the major historic sites in Rome, this is one of the best options. Your tour guide will take you to locations such as the Pantheon, Piazza Navona, and Trevi Fountain. As you walk around the city, your kids will be given a scavenger hunt and various trivia to keep them entertained and help them learn about Roman history. The Roman Pantheon is still a fully functional church which provides Mass twice a week. All visitors are welcome to attend if they wish. Many tourists indicate that the service held here on weekends is absolutely lovely. Whether or not you are a Catholic, you may want to consider coming at the following times to experience this free event. If you are not a local, you may want to let the security guards know that you are there for Mass before lining up. This can be a popular event and the guards will do their best to keep tourists out during these times unless they specifically show an interest in attending Mass.